Arabic calligraphy is a fascinating art form giving rise to expressions that combine spiritual meaning with aesthetic beauty. 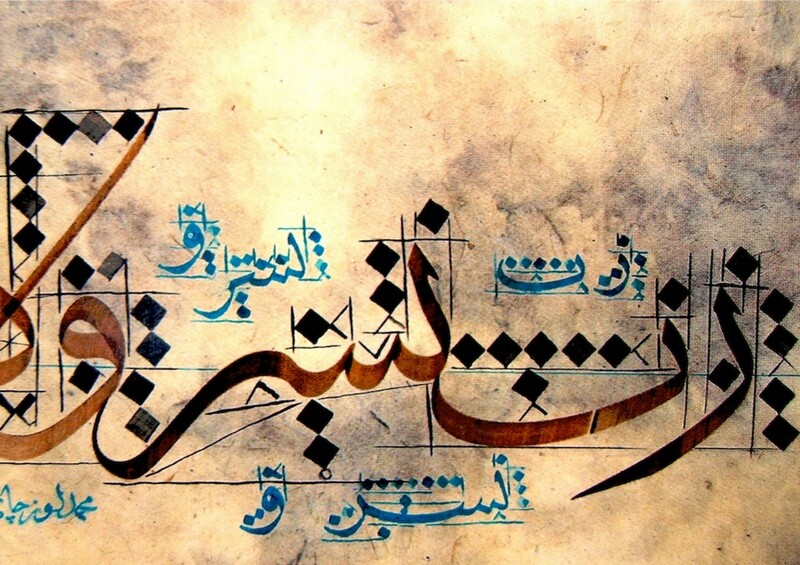 Calligraphic expression is a fundamental decorative element of all forms of Islamic art, ranging from Architecture to ornamental design, and has been widely used throughout historical and modern times (Massoudy, 1981). Numerous styles of script have been developed over time each with a variety of expressions and yielding different compositions. These include several Kufic and Cursive styles. Calligraphy is considered the quintessential art form of the Islamic world Arabic letters decorate objects ranging from bowls to buildings. Numerous scripts have emerged over the centuries that serve a multitude of religious, political, social, and cultural functions. This unit explores the variety and versatility of Islamic calligraphy and historical efforts to perfect and codify scripts and generate new forms. The chosen instrument for writing Arabic script is the seasoned reed pen. The nib is cut to an angular chisel-edge and slit mid-way to facilitate the flow of ink. In right-to-left strokes, the pen is moved against the grain, often noisily. In this motion the pen is difficult to control, recalcitrant to an extraordinary degree. Making a beautiful line requires a smooth, polished surface. Originally, scribal writing was on papyrus, making a smooth line impossible. Originally, too, calligraphy was done on vellum and parchment, which suited the heavy early scripts. When paper was first used in the Islamic world, two problems had to be solved in order to accommodate the peculiarities of the Arabic script. First, the paper had to be smooth so the pen and ink could flow “like breath,” as it is said. Also, the paper had to be made less absorbent so the ink would not penetrate the surface and spread in the paper’s fibre. Both of these goals were achieved by the application of sizes and coatings and by burnishing the paper to a high gloss once it was dry. That is the “prime directive” of the paper preparer. Over a period of 10 centuries or more, these processes were improved by empirical means until, by the 19th century, the Ottoman Turkish approach became the sine qua non of paper preparation.